*Argentina def. Serbia/Montenegro, 6-0. I put ARG atop my power rankings after the first group of games, and I'm looking like a smarty now. Crespo scored. So did lots of other guys. I don't think Serbia is all that good. Argentina is. Book it. Argentina's Esteban Cambiasso, left, celebrates with teammate Maxi Rodriguez. Holland def. Ivory Coast, 2-1: Looked like a Dutch blowout with two quick goals around the 25th minute by Van Persie and Van Nistelrooy. Then the Coast scored, and really played better ball during the second half. Lots of chances to equalize. None materialized. 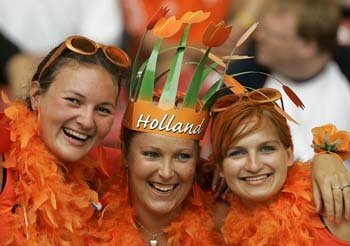 Not sure about Holland just yet. The match against Argentina next week ought to be a dandy. 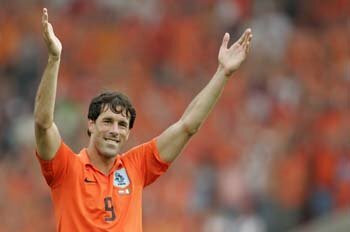 NED striker Ruud Van Nistelrooy celebrates his team's 2-1 win. Soccer chicks are good for the soul. *Mexico and Angola, 0-0: Pretty boring game to me. Mexico was great against Iran, then lost Jared Borgetti, the great Bolton striker, to a thigh injury. Without him, Mexico lacks creativity. They wanted Marquez to be the guy today. He clearly isn't that kind of player. Good for Angola, though. They gave it hell, no doubt. *Sounds like ENG striker Wayne Rooney, who returned to play on Thursday after a two-month absence, may be a starter for the Brits' game against Sweden next week. I'd sit Crouch. Owen is a better player, though I'm open to people who say Owen hasn't played well lately. I agree. *Funny how Foudy and Wynalda NOW have decided Roo's return affected the Brits yesterday. Really? Ya think? *Speaking of that, Foudy and Wynalda are getting old for me. I love some drama, believe me, but not like this. I'm not sure they're completely aware of what's going on. Arguing over a goal's aesthetic quality is dumb. It's a goal. Stop analyzing it like a painting. Dude crossed, dude headed, other dude missed. Period. Still on painkillers. I can move around the house now on crutches, which is an improvement. I'm an active person. Lying around in bed is not my idea of fun. I go in for a legit cast on Monday. 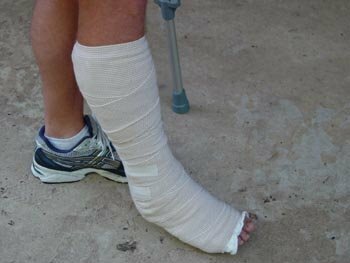 I'll haggle with Dr. Mattox and aim for a weight-bearing cast. He'll probably deny that, but I'll be persistent. I want to make progress -- or at least feel like I'm making progress. *When I came out of surgery on Monday, the nurse said my breath smelled like anesthetic. Wow. What the hell is that? I guess I was on the strong stuff. *It was weird looking at my face in the mirror after surgery -- and seeing tape residue near my mouth. That was from the breathing tube. I, uh, don't remember that part. *Speaking of stuff I don't remember: I get into the OR, I move myself to the actual operating table. That's a wrap. I don't remember counting, talking to anyone, nada. Bizarre. I was telling the gasman in pre-op that I'd recite "Money For Nothing" lyrics after he put the real anesthetic in my IV. Said I could get to the chorus -- at least. I failed. Hell, did I even start? Hey everyone. Still in bed, still watching a lot of soccer. *Ecuador def. Costa Rica, 3-0: The last goal came in the 90th minute by Kaviedes. Dude scores on a redirect, then celebrates by pulling out a friggin' MASK ... like Spider Man. How cool was that? Ecuador will play in round of 16. Believe me, people do NOT want to play this team right now. *England def. Trinidad & Tobago, 2-0: A Crouch header from Beckham in the 83rd minute moves ENG ahead. A 20-yard blast from Steven Gerrard gives ENG two goals. So the Brits move into the round of 16. Crouch, who stands 6-foot-7, heads it in. 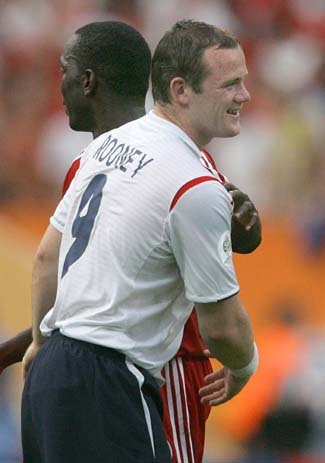 Wayne Rooney entered the game for Michael Owen around the 58' mark. England played with more enthusiasm and creativity with Roo on the pitch. He won't start against Sweden next week. They'll stick with Crouch and Owen for now. Rooney returned after a two-month absence. ESPN analysts Julie Foudy and Eric Wynalda ignored Roo's (subtle) contributions, adding more reason for me to mute the TV between matches. *Sweden def. Paraguay, 1-0: Freddie Ljungberg, he of Arsenal fame, scored late on a header to push the Swedes into second place among Group B teams. Sweden plays England next week. A draw or win ensures a jump into the field of 16. This team doesn't impress me much. I like the yellow boots, though. Bcck to ESPN ... can Wynalda shut up occasionally? He drowns out Foudy constantly, and it's quite irritating. You know she hates getting interrupted on live television. These two do NOT get along. Listening to him trash Claudio Reyna, then hearing her totally defend the guy cracks me up. Serbia/Montenegro v. Argentina, 7:55 a.m. -- Should be a blowout. Holland v. Ivory Coast, 10:55 a.m. -- Look for Didier Drogba (CDI) to go off. Mexico v. Angola, 1:55 p.m. -- Is Mexico as good as it looked against Iran? Yes, I care. I love soccer. One of the pitfalls of sports writing is that games you cover become trite -- to the point that the games seem like work all the time. I can't watch college basketball for fun anymore. Same for football. I'm not complaining; it's just part of the deal. So I watch soccer instead. Knology inexplicably carries Fox Soccer Channel, which is the best thing ever for me. I watch it daily. Most of my friends* don't understand the whole soccer thing, but it's one of the only sports I don't cover. I like it that way. I have watched all or parts of every World Cup game so far (save for JPN-AUS, which was held while I was in surgery) and here's my official WC Power Ratings after the first set of fixtures. 1.) Argentina: Riquelme and Crespo look great. The team has plenty of offense, and the defense looked swell. I think this is th team to beat right now. 2.) Brazil: Can't criticise a team loaded with this much talent. Still, they didn't look all that good against Croatia. Kaka's goal was sweet, though. 3.) Germany: Home team. Ballack is back tonight. This team will cause problems. 4.) Czech Republic: I know, I know. They beat a very overrated USA team. No matter -- CZE is a great team, and could move up this list if Baros returns and plays like he can. 5.) Spain: Xabi Alonzo and Raul and David Villa smoked a decent Ukraine team this morning. Can Spain actually accomplish something in this World Cup? Probably not, but this might be ESP's most talented team ever. Others receiving votes: Mexico, Portugal, Holland. *=Decatur Daily ace Bradley Handwerger, a valued friend, likes and appreciates soccer. Chattanooga ace Gentry Estes, another friend of mine, also likes and appreciates soccer. He likes Chelsea, though, which compromises his value to some degree. Hey everyone. It's Day No. 2 now and things are better. I can't see my ankle because it's all wrapped up, but I know the swelling is less of an issue now. The ankle feels better. I cut my oxycodone dose in half this morning. We'll see how long that lasts. I'm stil in bed. Still keeping the ankle elevated on a stack of four pillows. Still watching a lot of nothingness on television. I don't know how couch potatoes do it. *As my general anesthetic wore off late last night, I started getting the itchy-scratchies. It was not fun. I had to laugh, though, because I kept thinking of Tyrone Biggums -- the crackhead played by Dave Chappelle on his Comedy Central show. He's always scratching himself in mock withdrawal. *I can see why Oxycodone is addictive. I feel a rush of euphoria every time I take one of these red-and-white pills. My wife found a site on the Internet last night that claimed each pill is worth $7 on the street. They're worth more to me than that! I can't imagine how unhappy I'd be without painkillers. OK. That's all for now. Gotta get back in bed. Hello all. Surgery began at 8:30 a.m. or so and lasted approximately 45 minutes. The findings were good for me. 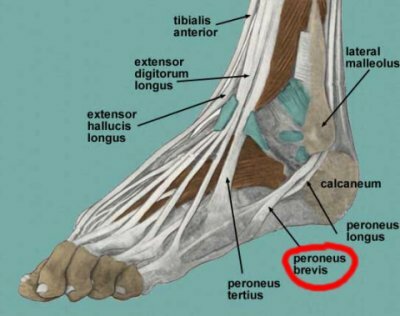 The peroneus brevis tendon injury was less serious than believed; Dr. Mattox estimated the tear at 33-50%. He stitched it back together. This is good news because a more significant tear would have forced a more invasive reconstructive procedure. I'm not in a cast. I'm instead in a very restrictive split-type thing. I"m not moving, that's for sure. Pain right now is a 7 on a 1-10 scale. I hope that goes down soon. I'm scheduled to have surgery on Monday morning here in Montgomery. Since I will be in a cast and otherwise unable to cover Auburn as I normally would, I'll instead give you all a blow-by-blow account of this surgery. I'll break in with scouting reports, too. I just wanted to show folks what this is like. Oh, and I'll be able to l ook back on this in a few months and enjoy it. I'm really not enjoying it right now. 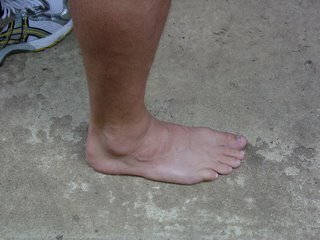 Here's what my ankle looks like on Sunday the 11th, 18 hours before surgery. It will not look like this much longer. All those hours on the arc trainer and treadmill -- for naught. I'll keep you updated about what happens next. I predict there will be an issue with the ligament (peroneal retinaculum) that holds the two tendons below the lateral malleolus. I keep feeling a "pop" sensation when I walk, and I think it's the tendons flipping around on that bone. It's what Curt Schilling had during the Bloody Sock ALDS and World Series.